Princess Alice Hospice Charity provides end of life care to adult patients, support for their families and friends free of charge, with over 30 shops across Surrey, South West London and Middlesex; engaged Complete Signs in September’11 to survey the entire estate and establish a refurbishment program from shop front to front counter. In less than seven days Complete Signs surveyed 34 Princess Alice Hospice’s retail shops and delivered a comprehensive design brief including a generous discount donation reflecting the charitable status. The brief addressed a complete shops refurbishment and provided Princess Alice with a Brand Identity Guide achieving consistency across all retail outlets. A key requirement was to maintain the exact background colour on all powder coated metal as this was an essential element in the original shop design. By late November’11 the pilot shop achieved a contemporary look & feel, proving concept giving way to the full refurbishment program. The Result: Bringing Charity Shops into the 21st Century! 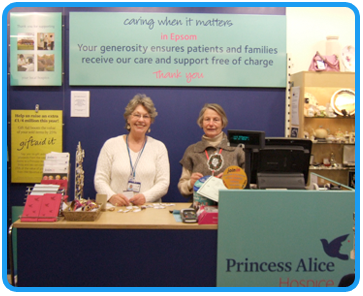 Princess Alice Hospice required an efficient and low cost solution to update their brand and customer engagement elements delivering a charitable retail experience worthy of the 21st Century. Complete Signs delivered the project, under budget on schedule! Furthermore, Complete Signs flexible team worked around shop teams without disruption resulting in a very subtle, complete facelift inside and out. At Complete Signs we understand how charities work and specialise in achieving maximum results for minimal investment. *To be eligable for 10% discount for life a minimum order of £250 is required and a link back to our website as a text link or an image link using our logo as one of your sponsors. Discount for orders exceeding 10% is negociable.